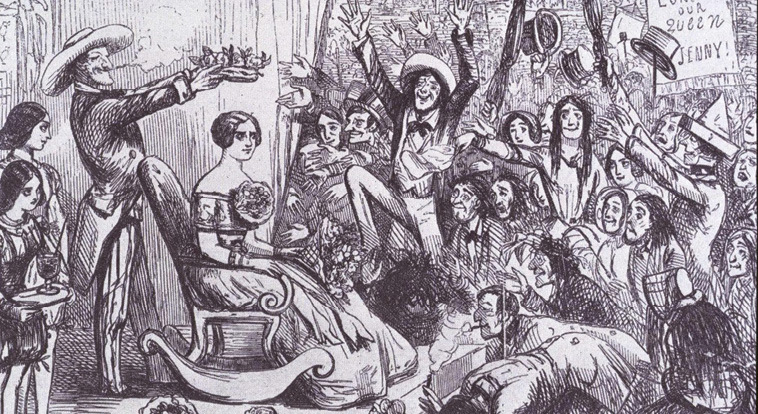 It was Christmas 1850, and the famed “Swedish Nightingale,” songstress Jenny Lind, was in Charleston as part of an American tour promoted by the great Phineas T. Barnum. Devotees thronged to the city from as far away as Georgia for her three sold-out concerts at Meeting Street’s Charleston Theater (destroyed by fire 11 years later). The crowds were so large that the description “a squeeze equal to a Jenny Lind concert” would become familiar around town. A caricature of Lind’s 1850 tour stop in New York City. Yet to the dismay of the gracious Charleston ladies who had hoped to formally welcome the international star, Lind was a private person, preferring the quiet of her suite at the Charleston Hotel (also on Meeting Street, it was demolished in 1960). One undaunted society maven even donned a maid’s uniform and carried a tea tray to the singer’s room in a failed attempt to gain an audience. Less impetuous residents respected Lind’s wishes, but to ensure she had the merriest of holidays, “a Forest tree was placed at her window, decorated with variegated lamps, which attracted much attention,” the News & Courier reported. Lind reciprocated the kindness. She always donated a portion of the proceeds from her concerts to charity, and she gave $500 to Charleston’s Ladies’ Benevolent Society. While the Holy City celebrated a particularly joyous Christmas, thanks to having a celebrity in their midst, Lind spent a quiet Christmas Day in her hotel room exchanging gifts with members of her entourage.